London Bound is a 10ply/worsted weight hat designed to be either beanie or slouchie length. 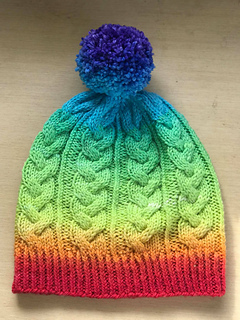 I designed this for my very best friend who is off to have a white christmas in London this year with some family - being from Australia she is in desperate need of an amazing hat to keep her noggin warm. London Bound is worked in the round is a super easy cabled knit. A massive thank you to my testers who are always amazing with their comments, suggestions and completion of work to a high standard. You guys make my job so much easier. All of my patterns are available for personal use and small scale production for handmade crafters to sell, please credit me as the designer as well if you do sell your items.